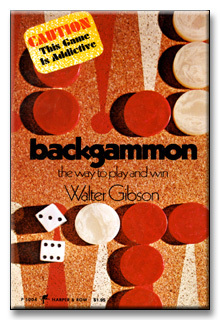 COVER: Backgammon is the most ancient of all games. One of the fastest and most exciting games ever devised for two players, it has been played by more people than any other in creation. A combination of chance and skill, there is no deliberation as in chess, just constant, exhilarating action. And it's as simple to learn as gin rummy. The equipment needed is minimal: a backgammon board (found on the other side of most checkerboards), thirty checkers (fifteen for each player), and a pair of dice. But a word of caution. Whether you play for the love of it or for money, this game will get under your skin, but you'll never be more happily hooked.